How would you use $60,000 and your Jewish values to make our community better? Each year, we bring together a group of Jewish teens from throughout the Greater Denver community to answer this question. Started in 2001, Rose Youth Foundation is a youth-led program, empowering teens to use the tools of strategic philanthropy to make a real difference. Over eight months, the 23 members of Rose Youth Foundation work together to discuss what it means to give in a Jewish way, explore community issues, determine a funding priority, meet with nonprofit leaders, and ultimately determine how to grant $60,000 to make our community a better place. We believe youth are not only tomorrow’s community leaders, they are also today’s, so in 2011, we began a campaign to endow Rose Youth Foundation. Our ultimate goal is to raise $2 million dollars to permanently fund this program. We want to ensure that future generations of young Jewish people will have the chance to serve their community as youth grantmakers and that our community will continue to benefit from their valuable leadership and unique perspective. To date, more than $1 million has been raised thanks to generous support from Rose Youth Foundation alumni, their families, individual donors and foundations. If you would like to learn more about Rose Youth Foundation’s endowment, please contact Sarah Indyk at 303.398.7416 or sindyk@rcfdenver.org. To make a gift to the endowment, visit Rose Community Foundation’s online donation page (In the “Please direct my gift to” field, choose Rose Youth Foundation Endowment). 2011 marked Rose Youth Foundation’s 10th year of Jewish youth engagement through grantmaking. In an effort to better understand the program’s impact, strengths and opportunities for improvement, we contracted with an evaluator to conduct a ten-year longitudinal evaluation. Read about what we learned in the Key Findings Report and the Full Evaluation Report. 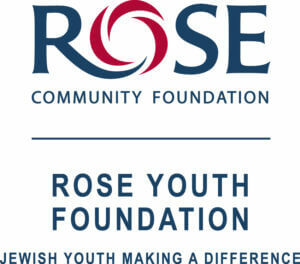 Rose Youth Foundation is an eight-month program, beginning in September each year. Members are accepted to serve a two-year term, provided they meet the program participation requirements. Most of my life I didn’t have a strong connection to Judaism. As I entered high school, I was looking for new things to explore. I wasn’t actively looking for a Jewish extracurricular activity, but when I heard about Rose Youth Foundation, it allowed me to be swept away on the journey of a lifetime.